Just because The Stasko Agency is a lady-driven company, it doesn’t mean we’re uninterested in the upkeep and maintenance of our cars! In fact, with summer roadtrips and multiple on-location client meetings right around the corner, we’ve been looking for a great place to take our Honda’s to get prepped for the warmer weather. 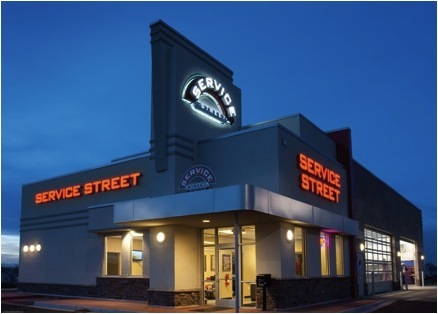 That’s why we’re so excited about our most recent client, Service Street. Industry veteran Greg Sands and expert financier Bill Fagan hope to revolutionize the auto repair industry with a new concept which will not only attract the best technicians, but will also present a clean, quiet, and visually appealing facility. Certainly service comes first when looking for a place to take your car. But it can be a daunting task to find a place you can trust for all your repair needs. And with most garages looking pretty much the same (box buildings with cars, parts, and tires outside), how do you choose one from the other? What we love about Service Street is that they promise top-notch service and set themselves apart with the design, cleanliness, and limited noise. The attention to detail (and lack of clutter) makes Service Street much more approachable. MYTH: You have to take your car back to the dealership for all repairs. TRUTH: There are auto repair facilities that are certified and trained to handle repairs for all makes and models. Service Street employs ASE certified technicians who provide a fully comprehensive range of auto repair and maintenance services. If your dealership is closing, you should consider looking into nearby service stations, such as Service Street, that can take care of your needs. Another perk of Service Street? They will come pick up your car and take it back to the garage, or they will take you to work after you drop your car off. Now that’s customer service. With The Stasko Agency’s fair share of car troubles (broken air-conditioning and catalytic converter at the same time), it’s nice to speak with people who are friendly and knowledgeable, who care about their environment and the surrounding retail developments, and who are extremely customer-centric. What else do we appreciate? Service Street is open from 6am-8pm Monday through Friday and on Saturday from 7am-7pm. So if you can’t pull yourself from work during the week, you have a full day on Saturday to get things done. And most repairs are completed within a day. The first Service Street is located down in Parker, CO, but expect to see hundreds more sprouting up across the United States in the coming years. Check out the Service Street Website for more details and contact information! A Memorable Memorial Day Event Great Press for Great Places!